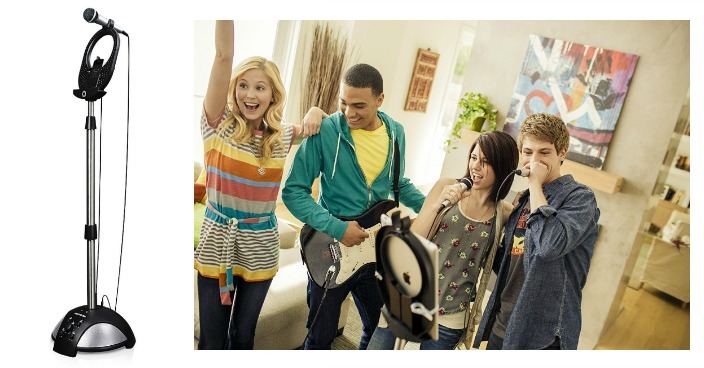 Memorex Home Karaoke System Just $49.99! Down From $90! You are here: Home / Great Deals / Christmas Deals / Memorex Home Karaoke System Just $49.99! Down From $90! Amazon has this Memorex Home Karaoke System on sale for $49.99 (Reg. $90)! Equipped with a universal line-in, and Bluetooth the SingStand 3 can connect to any audio device equipped with a headphone jack or Bluetooth technology. Using the input and included cords, you can access music and videos from tablets, MP3 players, smartphones, and a variety of other devices. The Singstand 3 also has a built-in cradle with protective strap, which can hold your device securely in place, giving you a convenient place to set your device and read lyrics while you hold the microphone.